Affinity purified against peptide NRIIERLNRVPAPPDV. 25 ug of cell lysates from various breast cancer cell lines and HEK293 cells transfected with either empty vector (UTR) or FLAG tagged IKK epsilon were separated on an 8 % SDS-Page gel and transferred to PDVF membrane. The membrane was immunoblotted with anti-IKK epsilon (701 – 716) at 1 ug/ml. Binding of the primary antibody was detected using rabbit peroxidase conjugated anti-sheep IgG antibody (1 in 10, 000 dilution, Pierce) followed by enhanced chemiluminescence (ECL, Amersham). 25 ug of HEK293 cells transfected with either empty vector (control), FLAG tagged TBK1 or FLAG tagged IKK epsilon were separated on an 8 % SDS-Page gel and transferred to PDVF membrane. The membrane was immunoblotted with anti-IKK epsilon (701 – 716) at 1 ug/ml (upper panel) or anti-FLAG M2 [Sigma] (lower panel). 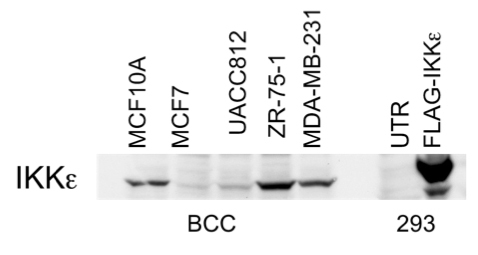 Binding of the primary antibody was detected using rabbit peroxidase conjugated anti- sheep IgG antibody (1 in 10, 000 dilution, Pierce) followed by enhanced chemiluminescence (ECL, Amersham). 1 mg of protein extract from RAW264.7 macrophages was incubated with pre-immune IgG (Ig) or either the first, second or third bleeds of affinity purified anti-IKK epsilon (701–716)at2or5ug. Thesampleswereincubatedfor1hrat4degConanendover end roller. 10 ul of Protein G Sepharose was added and incubated for a further 15 mins at 4 deg C. The beads were collected by centrifugation and washed three times in lysis buffer. The immunoprecipitates were separated on an 8 % SDS-Page gel, along with 20 ug of total protein extract (TL), and transferred to PDVF membrane. The membrane was immunoblotted with anti-IKK epsilon (Sigma) followed by HRP-conjugated anti-mouse antibodies with detection by enhanced chemiluminescence (ECL, Amersham). 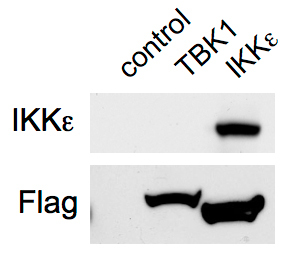 This antibody is specific for IKK epsilon and does not recognise TBK1. Although it was raised against the human sequence of IKK epsilon, it recognises both the human and mouse sequences of IKK epsilon.